With another week of action behind us, and some more fresh stats to analyze, I’m here to help you with your toughest fantasy football start/sit decisions for Week 14 of the NFL season. Excluding a Week 7 game where Michel exited early due to injury, he’s averaging 20.0 touches and 15.2 fantasy points per game over his last six games. Serving in the LeGarrette Blount role, he has an ideal matchup this week, favored by seven points against a Miami defense that’s giving up the fifth-most rushing fantasy points per game to opposing running backs. Ebron isn’t just a must-start as a TE1, but he also ranks top-40 in my flex rankings. Rivers has thrown for multiple touchdowns in every game this year, and currently leads all quarterbacks in passing yards per dropback (8.48). Although volume has been a concern in recent weeks, it hasn’t mattered much for fantasy, and it’s unlikely to matter this week, up against a Bengals defense that is giving up the most fantasy points per game to opposing quarterbacks. 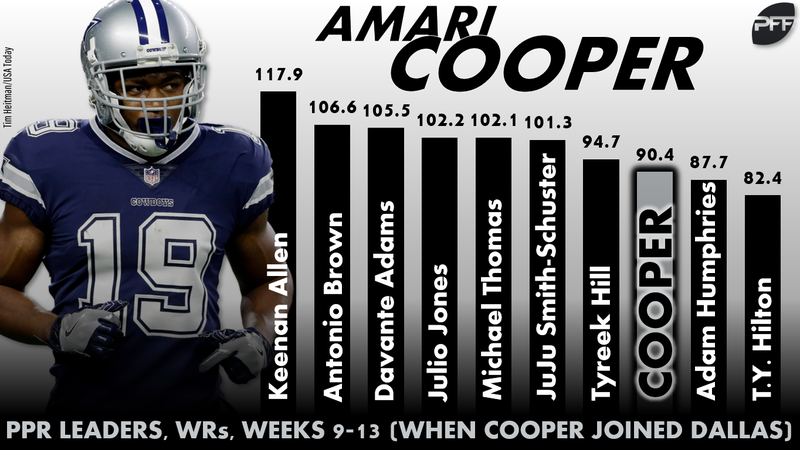 Since Cooper’s first start in Dallas (Week 9), he ranks top-10 among wide receivers in both expected and actual fantasy points. This week, he draws an injury-plagued Philadelphia secondary that is surrendering the second-most fantasy points per game to opposing outside wide receivers. Davis has been hit-or-miss all year, and though he’s been more “hit” than “miss” recently, he’ll be a miss this week with Jalen Ramsey projected to shadow. Through three career games against Jacksonville, Davis averages only 2.3 fantasy points per game. 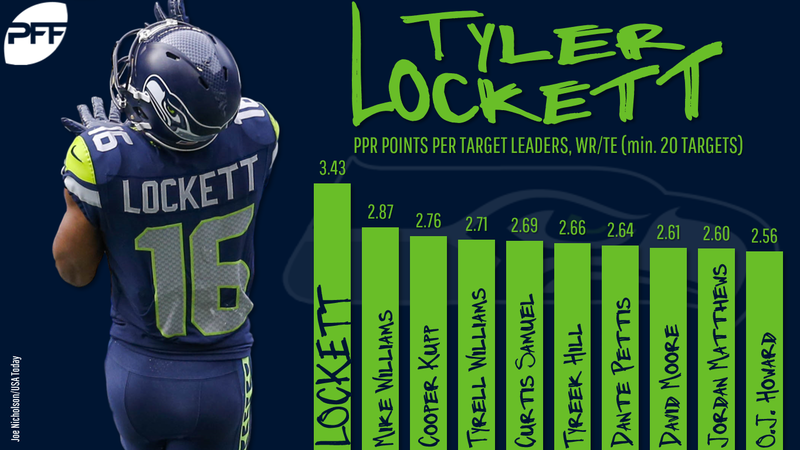 All year I’ve been falsely prophesying a coming regression for Lockett, based on his league-leading and absurd 3.32 fantasy points per target. It’ll be hard for him to stay efficient this week, in shadow coverage against Xavier Rhodes. In nine shadow games, and against some of the league’s best wide receivers, Rhodes is surrendering just 31.0 yards per game, and Davante Adams is the only receiver who has found the end zone against him. Golladay isn’t actually a “sit” by any stretch, but he is getting downgraded this week. We’re projecting a shadow situation from the league’s best shadow cornerback – Patrick Peterson. Even so, Golladay might overcome the tough matchup on good volume (he’s averaging 11.0 targets per game over his last four games) or on the approximately 30% of his routes he runs from the slot. He’ll be a low-end WR2 in my rankings this week. Jackson totaled 82 yards of offense last week, sure, but he also only had nine opportunities. I’m sure he’ll see more work this week (if Melvin Gordon is out), but I’m not sure he’ll see more than Austin Ekeler, and I’m doubtful he’d see enough to make him worthy of a start in shallow leagues. I have Jackson as a mid-range RB3 in my rankings. In the four games DeSean Jackson or Mike Evans has missed over the past two years, Godwin averages 8.5 targets and 17.5 fantasy points per game. Godwin is our 12th-highest-graded wide receiver this year and ranks 23rd (of 93 wide receivers) in yards per route run. This week, with Jackson likely out, he draws a New Orleans defense that is giving up the most fantasy points per game to opposing outside wide receivers and the most schedule-adjusted fantasy points per game to opposing WR2s. I think Samuels is a great play this week, with James Conner out, but probably not a must-play like we’ve seen from Pittsburgh’s backup running backs in the past (like DeAngelo Williams). Though Samuels has been named the starter, it seems clear, per this tweet, he’ll be working in a committee with Stevan Ridley. I think Ridley, who has had more touches than Samuels this year, could receive the majority of the team’s carries, though Samuels (who had more receptions than rushing attempts in college) is likeliest to dominate work as a receiver. That means Ridley could possibly have the better matchup, as Pittsburgh is favored by 10.5-points against Oakland’s run-funnel defense. Still, I suspect Samuels will have the better role overall and be more productive. Among tight ends, I have only five players ranked ahead of Samuels. Among running backs, he’s a mid-range RB2, while Ridley sits a few tiers below him as a high-end RB4. Over the past three weeks, Moore ranks eighth among wide receivers in fantasy points and 12th in targets. With Greg Olsen now on IR, there’s little reason to suspect things slow down this week, and especially not with CB Denzel Ward still in the concussion protocol. Even with Ward healthy, Cleveland already ranked third-worst in schedule-adjusted fantasy points per game to opposing WR1s – and, in recent weeks, that’s been Moore and not Devin Funchess. Winston and Ryan Fitzpatrick combine to average 26.3 fantasy points per game. If taken as one quarterback, that number would rank second-best this year and fourth-best all-time. This week, Winston draws a Saints defense that ranks fourth-worst in fantasy points per game (22.2) and sixth-worst in opposing passer rating (103.1). Although Winston’s risk of busting (or getting benched) might be higher than for most QB1s, his ceiling is sky-high in a game with a 56.0-point over/under, and he’s still worth starting as a mid-range QB1. Matt Breida played on only 10 snaps in Week 13, nursing an ankle injury, and has already been ruled out for Week 14. In relief, Wilson played on 54 of the other 66 snaps, drawing 15 carries and nine targets, while scoring 21.4 fantasy points. That’s RB1 volume and production, but it’s not a lock his role is as good this week. Still, I think he’s worth starting in most leagues as a fringe-RB2. 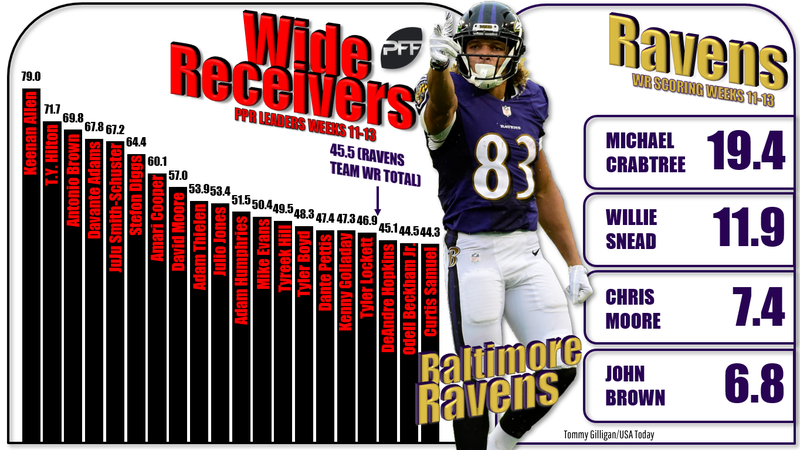 Unless Joe Flacco starts this week, Baltimore’s receivers are better off avoided. Over the team’s last three games, with Lamar Jackson starting, Michael Crabtree leads the wide receivers in fantasy points per game, with an average of only 6.5. Over his last five games, Shepard averages just 5.0 targets, 26.0 yards, and 7.0 fantasy points per game. In a neutral matchup this week (Washington ranks 16th in fantasy points per game allowed to opposing slot wide receivers), Shepard is better off left on your bench. This one is easy. Anderson hasn’t reached double-digit fantasy points since Week 5, and this week, we’re projecting Tre’Davious White to shadow. White leads all 58-qualifying cornerbacks in fantasy points allowed per route in coverage, despite shadowing many of the league’s best wide receivers. Coleman is averaging just 9.7 touches per game over his last three games, with Ito Smith averaging 7.3. Atlanta has apparently abandoned the running game, and when they do turn to a running back, they employ them in a near perfectly even split. Even in a better matchup this week than his last two, he’s just a low-end RB3. With Emmanuel Sanders and his 8.2 targets per game now out for the year, Sutton gets bumped up a tier in my rankings. Excluding Sutton, Denver is now without their most, second-most, and third-most targeted receivers. Denver won’t have much of a choice but to look Sutton’s way often when attempting to pass. I have him as a high-end WR3 this week. Last week, Ware saw 14 carries, one target, and three opportunities inside the team’s 10-yard line. All other running backs combined for just five carries, two targets, and zero opportunities inside the 10. That volume is good enough to solidify Ware as a low-end RB2 moving forward. He won’t be anywhere near as efficient as Kareem Hunt, and he will be far more touchdown-dependent, but he is the lead running back and primary goal-line option for the league’s most efficient offense. In a tougher matchup this week, he’s a borderline RB2 this week. Although the production hasn’t really been there, Ellington has seen target totals of nine, seven, and 10 since Marvin Jones’ injury. This week, with Patrick Peterson likely to shadow Kenny Golladay on the majority of his perimeter routes, this should open up more opportunities for Ellington in the slot. Arizona is already giving up the fourth-most fantasy points per game to opposing slot wide receivers. With Detroit already mathematically eliminated from the postseason, it seems unlikely the team will rush Johnson back into the lineup, but if he plays, he’s worth starting as a high-end RB2. If he’s out, Blount is worth starting as a mid-range RB3. In two losses over the past two weeks, Blount totals 36 touches, 164 yards, and two touchdowns. Detroit is favored by three points this week against a Cardinals defense that is giving up the most rushing fantasy points per game to enemy running backs. Since Week 6, Jones ranks 22nd among wide receivers in expected fantasy points per game (13.0). Although his production hasn’t been as good as his volume over this span, there’s good reason to believe both are better this week. The release of Kelvin Benjamin and Andre Holmes should result in more targets for Jones, as should this week’s matchup. The Jets are giving up the most fantasy points per game to slot wide receivers, but the 12th-fewest to outside wide receivers. He’s still just a WR4, but if desperate he might still be available in your league.